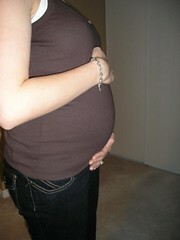 Another week has gone by and Shannon's belly is a little bit bigger again. There has definately been lots of growth in the past few weeks. According to Shannon the baby has also been quite active and I actually got to feel the baby kick a lot last night. I felt a wave of light bumps across my hand. Very neat. Other than that there isn't too much news to report. We did re-arrange the bedroom that will eventually become the nursery in anticipation of the arrival. I have also been keeping up on my parenting reading so I'll hopefully have some clue on what to do once the baby arrives. Posted by Anthony at 3/14/2007 09:42:00 p.m.